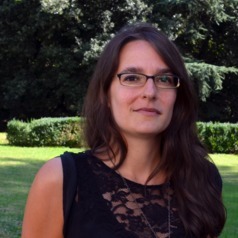 Alexandra Ricard-Guay is a Research Associate at the European University Institute, Robert Schuman Center for Advanced Studies (Global Governance Programme) since September 2014. She was the main researcher for the study ‘Demand-side of trafficking in persons in the domestic work sector’ (2014-2017), part of the DemandAT project. She holds a PhD in Social Work from McGill University – for which she was awarded the Vanier scholarship - and a M.A. in Political Science and International Relations from the Université du Québec à Montréal (UQAM). She has held research positions on various multi-site research projects, including on The coordination of services for victims of human trafficking in Canada. (2011-2014), and Access to health care for undocumented migrant women and children (2009-2014). Her research interests focus on trafficking in human beings, gender and migration, gender-based violence and adolescent girls, as well as precarious migrants and refugees’ rights. Alexandra previously worked for NGOs and international organizations in the areas of trafficking, women’s rights and education. She also conducted consultancies for the ILO, UNICEF and IOM on migration-related issues.